I’ve tried to mimick its performance in roadholding and top speed. 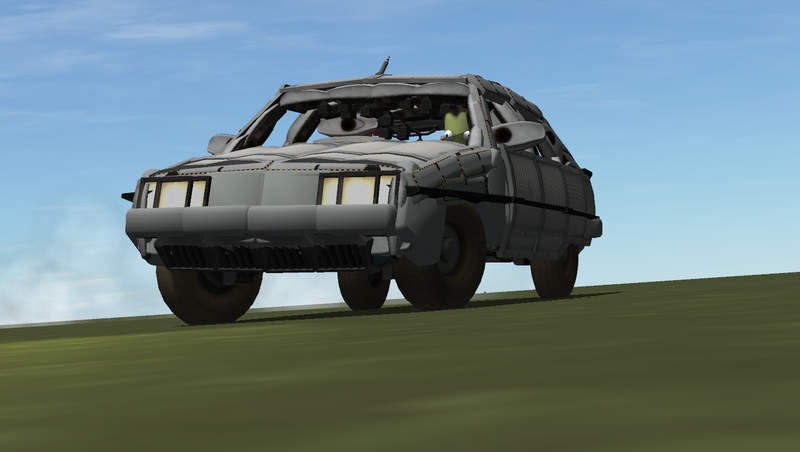 There’s a lot of body roll but it’s got excellent suspension and doesn’t mind driving on the hills and plains of Kerbin, it just doesn’t like the mountains very much. It’s built on a monocoque frame resembling the original. It’s a bit flexible but there aren’t any struts, anywhere. The real car is 1170kg. The kerbal version is 10 times as heavy. Building a car in this scale in KSP is hard. Flying Frankenstein used to be a GT with a 1.9 liter carburetted engine and a manual 5-speed. I’ve converted it into a turbodiesel automatic and gave it a digital dashboard. I’ve bought the car in 2006 and converted it in 2008. I plan to continue driving it for as long as possible. Tip: if you wish to increase performance, right click on the second engine icon while driving and set the performance limiter back to 100%. Note: the little split in the rear bumper is for the exhaust thrust of the jet engines. *Reworked the front. The headlights are narrower, the radiator grille is more pronounced. It looks much better now. *Reworked the rear. Added a bumper segment. *Added a dashboard & steering wheel. *Due to a small part count increase, increased engine power.